If you need a Conan fix and 5 hours a week just doesn't cut it, then look no further then your desktop with these Late Night wallpapers. Download FREE! 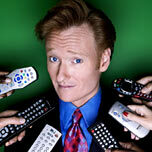 The term "Conan vs. bear" refers to a comedic web phenomenon created by Matt Alland and Randy Rydeen. Their web site ConanVsBear.com saw a traffic surge in August, 2005 when professional artwork began streaming in, after some initial fan artwork submissions. The web site depicts a fictional confrontation between Late Night talk show host Conan O'Brien and a bear. Different artists have unique interpretations of this concept from a wedding, to sock puppets, to clay animations. The artwork on the site is displayed in a random order, hence stick-figure style artwork appears side-by-side with elaborate paintings and professional cartoons. On September 9th of 2005, The site was noted by Conan O'Brien on Late Night with Conan O'Brien. During the interview with actor Elijah Wood, Conan said "It’s very strange when sometimes -- someone made me aware today of a website that’s artists doing drawings of me fighting bears. *audience cheers* Seriously, it’s me fighting bears!". On September 29th, Dan Piraro released a Conan O'Brien vs. Bear themed cartoon in his nationally syndicated comic strip, Bizarro. In October 2005, the number of unique artistic renderings surpassed 300.